Do you dream of visiting exotic destinations like Bhutan, India, Myanmar & Cambodia? Do you love taking photos and wish you could travel alongside a pro photographer to inspire your creativity and help you with camera settings? Our Photography Tours, provided by hand-picked, experienced travel companies across Asia, are created specifically for photographers, with itineraries designed to take in each country’s top attractions and give you the very best photo opportunities. Plus we’ve included some very special side-trips off the tourist trail so you can enjoy an authentic cultural experience with our friendly local guides on hand to ensure you have an amazing time. We take 8-10 participants on a tour and plan the tour dates around the availability of those interested. Join Award-Winning Photographer and seasoned Instructor Karen Lucas in the magical setting of Myanmar in November 2019 and enjoy an itinerary specially designed for photographers, taking in some of the country’s most beautiful sights and giving you the very best photo opportunities. We’ll time this 5 Day expedition to coincide with the Full Moon Day of Tazaung Mone and the Shwezigon Pagoda Festival held annually in Bagan. 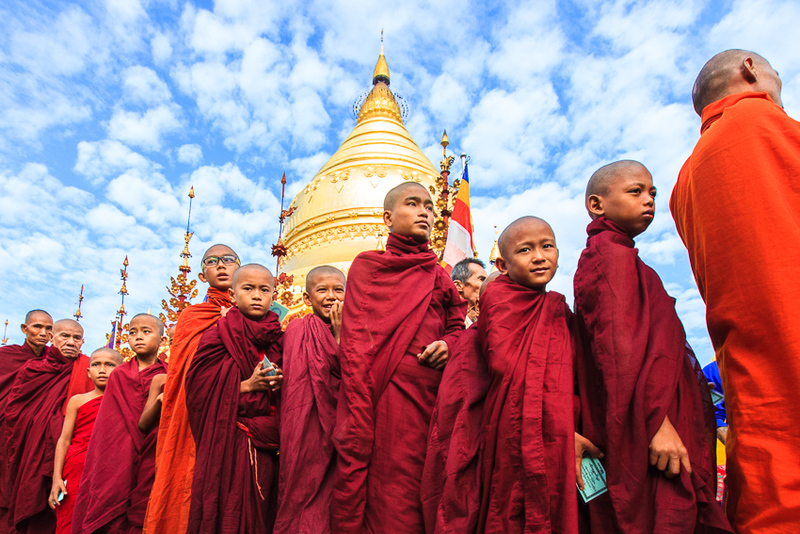 On this auspicious occasion you’ll see hundreds of red-robed monks and pink-robed nuns lined up in front of the golden stupas of Shwezigon Pagoda to receive alms. The festival is attended by locals from Bagan and the surrounding villages who’ll typically be dressed in their finest local costumes. The photographic opportunities are endless! Plus we’ve got a variety of fabulous excursions planned so you can enjoy Myanmar’s top sights and unique travel experiences. Don’t miss this fabulous opportunity…you don’t need to be an expert photographer to join! Shwezigon Pagoda festival: a joyous, colourful celebration attended by hundreds of devotees from the surrounding villages. Visit the temporary markets, catch the entertainments, and admire artisans at work. We arrive in Yangon early in the morning and, after changing money at the airport, we head straight to our first photo shoot at the stunning hilltop Shwedagon Pagoda, a 98-metre pagoda reputedly coated with 60 tons of pure gold. people of Myanmar as you enjoy some interesting travel portrait and street photography. The highlight of the day is a sunset visit to the Shwedagon Pagoda which becomes even more beautiful during the magical ‘blue’ hour. Enjoy capturing the beautiful temples and fascinating rituals. Bring your tripod. As we come in to land, enjoy the spectacular views over Bagan with over 2200 temples and pagodas stretching towards the horizon in all directions. Have your camera handy! Our first visit is to Ananda, rated by many as the most beautiful temple in Bagan, before continuing on to the fascinating Dhammayangyi Stupa with its chilling ghost stories! Enjoy photographing the people, the rituals and beautiful temple scenes. Enjoy lunch overlooking the impressive Irrawaddy River. In the afternoon you’ll have time to check in, unpack, relax and start reviewing the hundreds of photos you’ve taken already. Late afternoon we’ll head to Shwezigon Pagoda to catch some of the festivities and wander around the temporary market. In the evening we’ll have a photo review session over dinner so you can get 1 to 1 feedback on your photos and get ideas and inspiration from your fellow travelers. Today, you’re in for a visual and cultural treat…. it’s the Shwezigon Pagoda Festival which will be attended by thousands of villagers from the whole region. Get your camera ready because the highlight of the festival is a dawn procession of hundreds of monks in their beautiful red robes. Enjoy a picnic lunch in a quiet and often completely deserted temple ruin nearby and then enjoy the festivities in the local village. Later, relax on a scenic boat ride on the Ayeyarwady River as you watch the sun set behind the mountains. Start the day on a high… with an optional but HIGHLY RECOMMENDED sunrise hot air balloon flight with Balloons Over Bagan. Photograph the balloons during setup and flight, and enjoy the stunning temple views. Or if you prefer not to fly, we’ll take you to great viewpoint where you can watch the balloons emerging on the horizon and floating along the temple-studded valley (a breathtaking sight!). After breakfast at the hotel, visit the bustling Nyaung U Market, where people from all around town come and buy their vegetables, herbs, meat, etc. This is an excellent place to develop your travel portrait, street photography and low light photography skills, plus stock up on gifts and souvenirs. Enjoy lunch in Old Bagan. In the afternoon we’ll stroll through the Village of Taungbi to experience daily life and visit the old wooden monastery built for royalty. As the day wanes, continue the tour by horse cart and climb up Pyathagyi Pagoda for the most dramatic sunset over Bagan, complete with a refreshing drink! Bring your Tripod and Headlamp. On arrival in Yangon we’ll head straight to the beautiful Shwedagon Pagoda temple complex for our last photo shoot. Soak up the atmosphere and enjoy exploring and photographing this massive structure in more depth. Enjoy a packed lunch at Shwedagon Pagoda. Transfer to airport. We bid a sad farewell to the beautiful country of Myanmar and make our way back to our home countries. Note: The itinerary may change due to weather conditions, festivities, or other unexpected events. We recommend arriving early in the morning of the tour start date or the evening before (we can arrange a discounted hotel rate for any additional nights spent in Yangon). On the last day of the tour, your flight should not leave before 4:30pm. * Price is for Cheque or Bank Transfer payments. Additional 5% Bank Fees applies for Credit Card payments. A deposit of $1500 is due upon booking to secure your place. The balance is due 60 Days before the tour departure date. Welcome to Bhutan, the last Himalayan Buddhist Kingdom, a country shrouded in mystery and steeped in traditional Buddhist culture. In March 2020 we’ve got an extra-special treat for travel lovers who want to explore Bhutan, gain confidence with their cameras and learn how to shoot more creatively in this culturally-rich, historic location. We’ll time this 6 Day expedition to coincide with the 3-Day Talo Tsechu Festival, held in a picturesque village in the hills above Punakha (altitude 2800m). This is a typical Bhutanese festival, rich in culture and tradition, attended by the residents of Talo and their relatives from around the region. 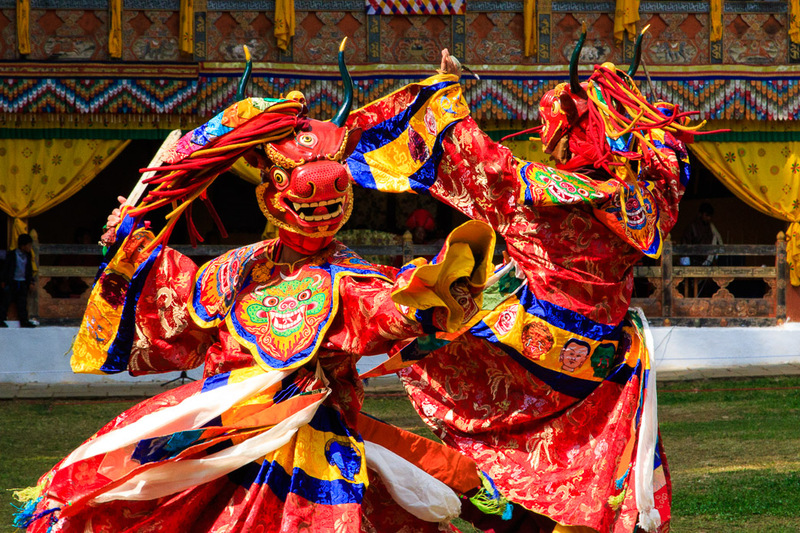 You’ll experience and photograph the rituals, the impressive masked dances, the hilarious shenanigans of the jesters, and the thrills and delight of the spectators, who’ll be dressed in their finest Bhutanese costumes. Plus we’re got a host of fabulous excursions planned to some of Bhutan’s most beautiful sights and some authentic cultural experiences to give you a real flavour of this mystical country and its deeply spiritual people. 2 Days at the vibrant Gangtey Festival. This will be a niche travel experience where you’ll be immersed in the local culture in one of the most beautiful settings in Bhutan. Welcome to Bhutan! After being greeted by our friendly local guide, we’ll leave Paro late morning and drive to Bhutan’s capital city Thimpu (about 1.5hrs), stopping off at Tamchog Lhakhang along the way. This temple was built by Thang Thong Gyalpo of Tibet at the foot of the Phurdo mountains. The colourful, prayer-flagged iron bridge which spans the Paro River is great to photograph and quite something to walk across with its swaying action and swirling waters visible through the mesh ‘floor’ beneath you. After lunch and hotel check-in, we’ll explore downtown Thimpu, a great opportunity to get a sense of daily life and get started on some interesting street photography and travel portraits. If time permits we may visit the Sangey Arts Gallery or Buddha Arts Gallery where you’ll be able to see (and bring home) beautiful Bhutanese paintings & handicrafts. Before sunset we’ll be heading uphill to a great vantage point where we can capture beautiful views of Thimpu and Tashicho Dzong which houses the secretariat building, throne room, office of the king, and central monk body. Today we have an early start with a sunrise photo shoot at the impressive Buddha Dordenma Statue, a 51.5m high seated Buddha gilded in gold. The throne that the Buddha sits on is a large meditation hall and within the statue are 125,000 smaller Buddha statues, also gilded in gold. It’s located on top of a hill in Kuenselphodrang Nature Park and overlooks the Southern entrance to Thimphu Valley so if the weather is clear we’ll have an excellent view of the valley and the mountains around. Mid-morning we’ll leave Thimpu and make our to the Punakha district, crossing over one of the Himalayan mountain ranges via the famous, winding Dochula Pass. At it’s summit of 3100 metres we’ll visit the impressive Druk Wangyal Chortens – 108 stupas built by the eldest queen, Her Majesty Ashi Dorji Wangmo Wangchuck. We may also be able to see Bhutan’s highest mountain Mt. Masanggang in the distance – its peak reaches 7158 metres. We’ll enjoy lunch with views over the rice terraces at Sopsokha in the Punakha Valley, a pleasant village often referred to as the Fertility Temple Village – the reasons will become clear when we explore the village and Chimi Lhakhang in the afternoon. Late afternoon we’ll check in to our hotel and you’ll have time to download and sort through your photos to select those you want to show later. After an early dinner in the hotel we’ll have a Photo Review Session where your instructor will give you individual feedback on your favourite 20 photos. This is a great opportunity to get inspiration and feedback from both your instructor and fellow photographers and to get tips on how you can improve your photography and what skills you can work on. Get ready for an action-packed day of photography at the Tsechu Festival in Talo, a picturesque village scattered along a ridge above the Punakha valley at an altitude of 2800 metres. A Tshechu is a grand religious event, celebrated once a year and spanning several days, where the entire community come together to witness religious mask dances, receive blessings and socialize. It’s believed that everyone must witness the mask dances at least once to receive blessings and wash away their sins. Every mask dance has a special meaning or story behind it and many are based on ancient stories from as far back as the 8th century. The dances are fascinating to watch and photograph and so are the spectators! There’s so much colour, movement and action and you’ll have enough time to be able to move around and approach the scenes from different angles, try different lenses and get creative with your shutter speed and aperture settings. There will also be lots of activity around the festival, including a market, and this is a great opportunity to immerse yourself in the local culture and experience the joyous festivities with the locals. Good news! Today you can enjoy a lie-in! Mid-morning we’ll go to Punakha (about 40mins drive) to visit Punakha Dzong, justifiably described as the most beautiful Dzong in Bhutan. The name means “the palace of great happiness or bliss” and that describes our previous visit there very well. This dzong made a deep impression on us during our last photography tour and we all wished we’d spent more time there as there’s so much to explore and photograph and the monks we met were very obliging and friendly. Watching one of the ceremonies when the monks chant is a very moving experience and I was very happy that we weren’t allowed to photograph that particular ritual as we often forget to put the camera down and just soak up the ambience and allow ourselves to enjoy the moment. We’ll break for lunch in Punakha and then return to the dzong in the afternoon and we’ll finish the day’s shooting with a sunset photo shoot overlooking the dzong from across the river. Bring your tripod as we can do some interesting slow shutter speed techniques to blur the movement of the water. Today we depart extra early to arrive at Talo at 5am for the most of important day of the festival. Witness the sunrise procession of villagers and monks and the unfurling of a massive thongdrel – a traditional, silk appliqué thangka which is raised before dawn and then rolled down again by morning. Viewing of the thongdrel is said to cleanse one’s sins. After the procession, we’re treated to more mask and folk dances, culminating in the deeply religious and historic performance of the Zhungdra by the Talo dance troupe. After lunch we’ll visit the Khamsum Yulley Namgyal Chorten, built by the third Queen Mother. It’s a beautiful example of traditional Bhutanese architecture and art, and the only one of its kind in the world. Getting there involves an easy hike through the rice paddies and then a hike up a steep hill (good training for Tiger’s Nest!). Late afternoon we return to our hotel to relax, download photos and prepare for our second Review Session. After dinner we’ll have another Photo Review Session so you can show your photos, get feedback, and learn and be inspired by your instructor and follow travelers. We’ve saved the best for last! We’re up early on our last touring day to catch the sunrise at Dochula Pass before driving to the upper Paro Valley, which we should reach by late morning. We’ll arrive in a peaceful grove where we’ll start the most rewarding and iconic trek of the trip – up to the stunning Taktshang Monastery (Tiger’s Nest), one of Bhutan’s most sacred sites. It’s the country’s most recognizable cultural icon and is perched 800m up a seemingly-sheer cliff. Legend has it that Guru Rinpoche flew to this site on a tigress’ back to subdue a local demon. Thereafter, he mediated here for 3 months. Tiger’s Nest is a very interesting monastery which you can photograph from lots of different angles as you climb higher and higher up the mountain. When we’ve visited on previous occasions, it was wonderfully peaceful and we spotted beautiful birds and cute squirrels along the way. At the monastery we met a few of the monks who were based there and it was fascinating hearing the stories of where they came from and how they ended up there. We end the tour with a well-earned, celebratory dinner in Paro. We bid a sad farewell to the fascinating Kingdom of Bhutan and make our way back to our home countries. 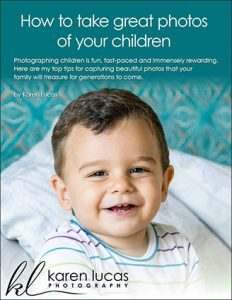 The best part about a Karen Lucas Photography Tour is that it’s all about photography – so when you see something you want to photograph or need help finding the best way to photograph it, simply let your instructor know. Our itinerary is fluid so we’ll adapt it to events happening on the ground and the preferences of the group. Our local English-speaking tour guides are at hand to translate when you want to communicate with the locals or find out more about the history and culture. And, they’re very happy to share their local knowledge of where to get the best shots and how to approach certain scenes and still be culturally-sensitive.